With safety continually being our first priority, and second keeping expenses low to our customer, we offer shoring stabilization. We are constantly looking for solutions that will allow us to work more productively, and safer. The pictures on this page are from our job sites. Using the proper shoring equipment allows us to complete the job safely, on budget, and on time. Shoring will also allow us to work in High water table areas safely. 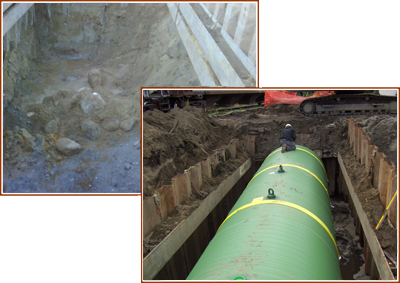 The installation of shoring equipment allows for stabilization in usually unstable conditions.